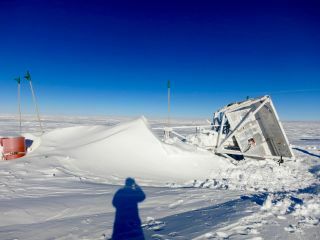 The NASA-funded GRIPS balloon telescope was dug out of the snow in good condition a year after it landed in Antarctica — weather prevented researchers from picking it up when it first landed, although they did recover the data at the time. Scientists successfully recovered an Antarctic high-altitude balloon telescope after it sat in frigid conditions for almost a year. The balloon telescope had spent 12 days flying 24 miles (39 kilometers) above the continent before scientists sent a preplanned command to cut the payload from the core. After the telescope parachuted onto the ice on Jan. 30, 2016, scientists were forced to leave it there due to incoming winter weather. "Despite sitting on the ice for a year, no snow had made it into the electronics," Hazel Bain, a University of California, Berkeley solar physicist on the GRIPS team, said in a statement. "The cryostat instrument, which houses the GRIPS detectors, seemed in great condition, and we're hoping to use some of the instruments again." After recovery, the instruments were flown back to the National Science Foundation's Amundsen-Scott South Pole Station, about 500 miles away. They were then dried out and packed for shipping to the National Science Foundation's McMurdo Station, where the mission began last year. "The U.S. Antarctic Program's Ocean Giant, the annual resupply vessel to McMurdo Station, will return the instruments to the U.S., where they will eventually undergo testing and evaluation for potential future flights," NASA officials said in the statement. The GRIPS balloon telescope launched Jan. 18, 2016, in Antarctica. The mission is a balloon-flown telescope that studies high-energy particles created by solar flares. Flares are often accompanied by coronal mass ejections that send charged particles toward Earth, sometimes damaging satellites or power lines. So, scientists research the flares to learn more about how they are generated, and their potential effects on Earth. GRIPS specifically analyzes X-ray and gamma-ray emissions, which are both wavelengths of light that are largely blocked by Earth's atmosphere. The high-altitude mission allows scientists to study these wavelengths above most of the atmosphere, for a lower cost than a typical space mission. Further, the instruments aboard GRIPS examine coronal mass ejections with three times more detail than instruments available in space, NASA said. Studying X-rays and gamma rays shows the composition, abundance and dynamics of solar flare material, the agency added.